Phil Mickelson continued his inexorable march towards becoming world number one for the first time when he carded an two under par 68 to lie just one stroke behind leader Retief Goosen at halfway in the WGC-Bridgestone Invitational at a steamy Firestone Country Club. 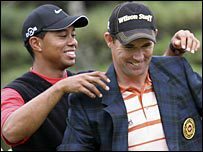 With world number three Lee Westwood withdrawing injured and Tiger Woods making up the numbers on six over par, the 40-year-old left-hander knows that a top-four finish would be enough to see him crowned world No 1 for the first time providing Woods finished outside the top 37. “Obviously it would be cool. I’m not going to say it wouldn’t,” said Mickelson, who is tied for second place with Justin Leonard. “It would be something I would love to do and ultimately be regarded as No. 1 according to the rankings and so forth. And I know that I’ve got a great opportunity this week. I know that I’m playing well, and this is my best opportunity. I try not to think about it. Holywood’s Rory McIlroy is not out of the running for the title either after a 69 that left him just four shots off the pace on three under par. “I gave myself a lot of good chances out there, and I gave myself five good chances coming in and hit really good putts,” said McIlroy, who totally outplayed Mickelson from tee to green. “I could have birdied three or four of the last five and wound up playing them in just level par. If I keep giving myself these sorts of chances, I feel as if I can go pretty low out there. While they are playing for a $8.5m purse and first prize of $1.4m, Padraig Harrington and Graeme McDowell appear to one-eye on next week’s US PGA Championship at Whistling Straits rather than the battle for their first World Golf Championship title. As Goosen followed an opening 67 with a 66 to lead on seven under par, Harrington fired a level par 70 to trail the South African by six shots with McDowell joining the Dubliner in the chasing pack on one-under when he bogeyed three of his last six holes for a 73. “To be honest, I just missed a few too many fairways today,” said McDowell who recovered from early bogeys at the 12th and 13th with birdies at the 17th and second before dropping three shots on the homeward run. “I wasn’t missing them by much but just sort of a few yards here and there, just making it difficult to make birdies. I just didn’t scramble very well. I kind of left myself too much to do from eight, ten feet and really didn’t make a lot of putts. McIlroy was also on the fringes of contention after outweighing bogeys at the first, fourth and 11th with birdies at the third, seventh, eighth and 13th. The young Ulsterman could easily have shot in the mid-60s but he was let to lament three missed birdie chances inside 15 feet at the 15th, 16th and 17th. As for McDowell, his cause wasn’t helped by 32 putts yesterday and he’s hoping his putter can heat up in time to challenge for his second major title in Wisconsin next week. “I feel really good about my game,” he said despite bogeys at the fourth, eighth and ninth. “I just played the last five, six holes badly, but yesterday was probably the best I’ve played in about six weeks. “This week is a great week to get ready for next week really. I just need to get my putter heated up because I putted badly. McDowell confessed that there is a tendency in no-cut events to play more attacking and ultimately riskier golf but added that the World Golf Championships were an excellent way to gauge the strengths and weaknesses of your game. Fully recovered from the dehydration problems that affected him during the first round, Harrington said he was pleased with driving performance despite hitting just six of 14 fairways in an even par round that was marred by a double bogey six at his 10th hole, the first. Having birdied the 11th thanks to a stunning approach to 18 inches, he parred his way through the back nine before a hooked tee shot at the 399 yard opening hole prevented him from reaching the green. Faced with a 30 yard pitch from the fairway, he came up short in the fringe and took three more to get down from there. And while he got up and down from greenside sand at the par-five second to get his round back to level par, he hit just one fairway coming home and needed his short game to save him further grief at third, fifth, eighth and ninth. Harrington denied that he had any pressing worries about his game ahead of the final major of the season. “If there was a sense of urgency about next week I’d be tapering down now. I am doing the opposite,” he said. “I am just working away at my game and know I need to do a bit better a job on Monday because it was a little frustrating out there. But such is life, I’ve got a major next week. “I am just working on a few little things that are just distracting in terms of performing this week. I just want to get over those and come Sunday just be comfortable with where my game is at and feel the game I finish with on Sunday is going to be the game I start with on Thursday next. First round leader Bubba Watson shot a one-over par 71 to finish the day tied with Sweden’s Peter Hanson (66) and American Bo Van Pelt (68) on five under par. Rory McIlroy produced a brilliant par save at the last to keep the leaders in his sights in the WGC-Bridgestone Invitational in Akron. 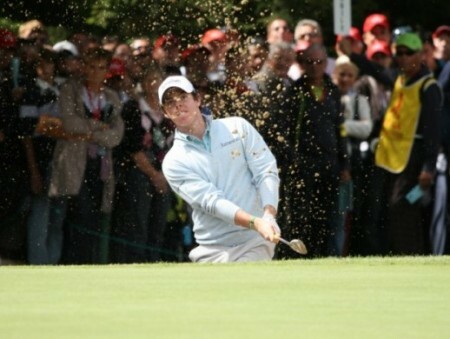 Rory McIlroy hits on the 10th tee at Firestone Country Club in Akron. 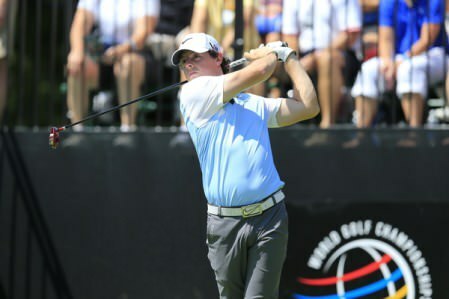 Picture: Eoin Clarke www.golffile.ieOne year after relaunching his 2012 season in Akron, Rory McIlroy returned to Firestone to turn back the clock again and opened with a level par 70 in the WGC-Bridgestone Invitational.